I'm so excited about our new free BOM. I love Christmas - the sights, the smells - and yes - the quilts. Last month I published the first row - The Holly Row - of my new, free, BOM. Some have expressed concern about stitching all that holly. For some, all those points are intimidating. For others, it is rather monotonous. For others it is too time consuming. Whatever the problem there is a solution. We have been having a discussion on the Apple Blossom Quilts Facebook page about what we can do to solve this problem. We have come up with one excellent solution. It has been suggested that we use a 4"-5" border print in place of the applique holly. Can't find an appropriate border print - then try a pretty Christmas fabric. You can also use just a plain colored fabric or a tone-on-tone fabric to replace the holly row. I would like to make another suggestion. Substitute a favorite pieced block for the Holly Row. The quilt is 32 inches wide. By using 8 - 4" (finished size) blocks, you could create a totally different look. The Holly Row finishes at 5" wide. Substituting 4" blocks for the 2 holly rows will make the overall length of the quilt 2" shorter but it should still look nice. We would love to have you join us on Facebook. I will be sharing tips and tricks on the construction of this quilt and it is my hope that you will share your thoughts on this project. I would also love to have you share photos of your project in process. To follow us on Facebook go into Facebook. Search on "Apple Blossom Quilts". Then select the one that says "organization". Click on "Follow". I would love to have you join us. Can't you just see your favorite toddler curled up in this quilt. Older children will love it as well. I made it with my Quick Prep Applique Method but it would be just as nice and a lot faster made with machine applique. I used buttons for the eyes but would recommend using an ultra-suede eye for children under 3. The quilt is 48 3/4" x 56 1/2". 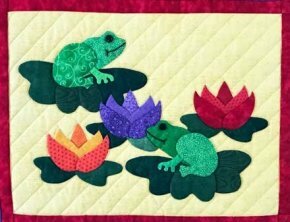 Each frog design is full size and on it's own sheet of 17" x 22" paper. There will be an introductory price for one month. 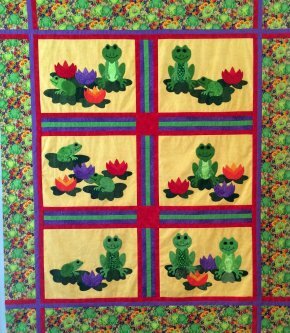 Get your "Froggie, Froggie" pattern for 25% off by clicking here. The "Baubles Row" will be coming your way in March. I will also be publishing a new baby quilt called "Sleepy Teddies". For those of you who have taken my workshop, you will recognize the teddy in this pattern. For a number of years I've used it as an example of sculpting (padding) an applique patch. I think you will enjoy this quilt. Speaking of specials, in honor of our newest free BOM, I'm going to have a one month sale on each of my Christmas patterns. One pattern per month until they have all been offered. I'm starting with "Celestial Chorus". 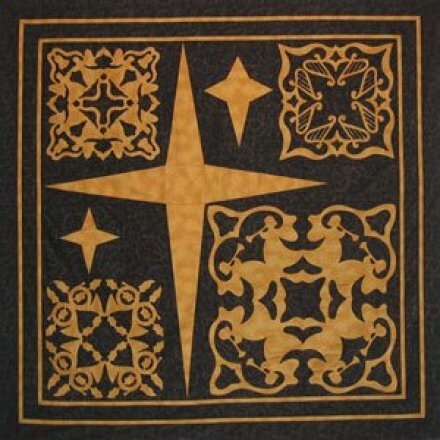 This pattern is very popular as a Christmas quilt for a church. I would recommend making the background the color of the church carpet. For example, for a church that has a maroon carpet, I would make the background for this quilt a very dark maroon. The pattern includes paper piecing patterns for the stars. The paper cut designs are all full size. I used gold braid for the strings on the harps. For one month you can purchase this pattern for just $25.00. That's over 30% off and is the lowest offering ever for this pattern. Click here to get your copy of "Celestial Chorus". 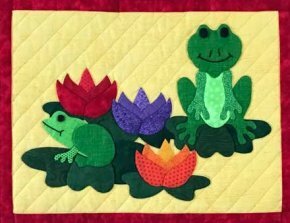 Click here to download the instructions for this quilt.